Trinity Designs: Order Online and Win! We are off on another ice skating adventure - this time headed up to Ann Arbor, Michigan for the Porter Synchronized Skating Classic. Did you know that Ann Arbor is the birthplace of Synchronized Skating? Well it is! Since I won't be in the studio for you these next few days, I thought I'd run a little special for those of you who want to place an order with me ONLINE using my website! Between now and Midnight on Sunday, December 7th, anyone placing an order online with me for $50 or more in products will go into a drawing for this very cool, now retired, new and Never used stamp set. Order $100 and get two chances to win! Perfect Presentation was a Level 2 Hostess set last year and is the perfect set for you to use right now for making gift cards, tags and lots of fun embellishments for your holidays! So don't wait another minute! Go to my website HERE and click the "SHOP NOW" button in the upper Right Corner! When you've placed your order, I am notified via e-mail so it's just like Santa watching! I KNOW who is entering the drawing! I will pick a winner at random when I return to the studio on Monday and notify you by e-mail and announce it here on the blog. You never know, I might just pick 2 names or maybe even three! Let's see, if Emma's skating team earns a medal, I might just give away 4 stamp sets - but you won't know if you don't place an order to qualify! 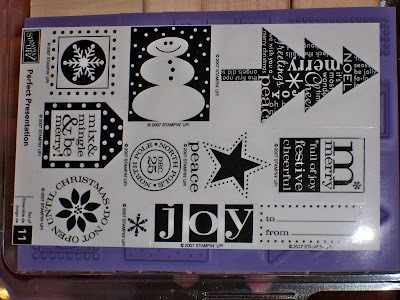 I've prepared some creative posts for you that will appear while I'm gone, so stay tuned for some fun stamping ideas! Now, go on, go shop!